If reading the Bible does not raise profound problems for you as a modern reader, then check with your doctor and inquire about the symptoms of brain-death. I have never heard of any Christian who haven’t, at one time or the other, struggled with some parts of the Bible. Needless to say, wrestling with difficult Bible passages is one of the most mentally and emotionally strenuous situations for Christians. Not only are these moments difficult, they can have long lasting ramifications as well, regardless of whatever answer(s) you settle on. This is not an exercise one takes lightly and the answers to those agonising questions sometimes take a lifetime to obtain. Encountering God In Tyrannical Texts deals with six controversial Bible passages (I Timothy 2:8-15; Ephesians 5:21-33; I Corinthians 11:2-16; I Corinthians 14:33b-36; I Timothy 5:3-16; Romans 16:1-16) that seem tyrannical in nature towards women. More importantly, the author explains why these six passages have no weight on today’s Christian women. The author says that instead of pretending such Bible quotations don’t exist, blanking them out, or whitewashing them, we must embrace and debate these passages in our local churches and groups. 1. The difficult text is worthy of charity from its interpreters. 2. Argue with the text, confident that wrestling with Scripture is an act of faithfulness. 3. Resist the temptation to throw the baby out with the bathwater. 4. Learn from the dangers as well as the insight that biblical texts present. 5. Don’t let anyone tell you that you are not taking the authority of the Bible seriously. Struggling with difficult passages is a universal situation for Christians and I find the author’s five steps valuable. While they are not a panacea for most problems of this nature, it is a useful template or mind-set to have while grappling with difficult biblical texts. Also the rigour with which the author handles the Bible passages is to be admired. She is certainly skilled and well-versed in the nuances of Bible interpretation and translation. You will also learn more about the Bible books that derived their authority by canonisation and those who do by authorship, among other things. Personally, I think the author falls foul of this standard. I believe her feminist perspectives did colour a lot of her arguments, not enabling her to give some of the examined tyrannical passages a fair shake in the light of the whole scripture. The thing is, a lot of Bible passages have been used as a pretext by insecure men to bend women into submission in time past and today. The problem isn’t necessarily with the texts. Humans have the ability to bend even the most innocent of all words into something perverse if given the chance. Biblical texts that are less “tyrannical” in nature have been used to wreak havoc by insecure, terrible people over the ages. Also, the present day church structure isn’t helping and does help foster this malaise. The Bible argues with itself in many instances. Voices with contrary opinions beg to be heard, which is why a classic principle of biblical interpretation is that we are to interpret Scripture by Scripture: the entire biblical canon is the context for understanding the fullness of Christian faith and life. Our willingness to stick together and engage the often-painful process of communal discernment – when it would be easier to pick up our toys and play elsewhere – is in many instances our most convincing witness to the truth and power of the gospel we proclaim, for it is a gospel that makes a difference in how we deal with those with whom we disagree. Negotiation of cultural conventions is an important part of ...(Christian) debate in all times and places. Because cultural norms, perspectives on social propriety and decorum vary and are constantly changing in different times and places, this matter require ongoing communal discernment. Encountering God in Tyrannical Texts is a controversial book and I love it. Though it falls short of being balanced, I think the intent is there. The handling of the scripture is superb and the writing is simple and clear enough for non-theologians to understand. The author’s explanations sometimes get a little complicated but that doesn’t detract too much from the overall clarity. 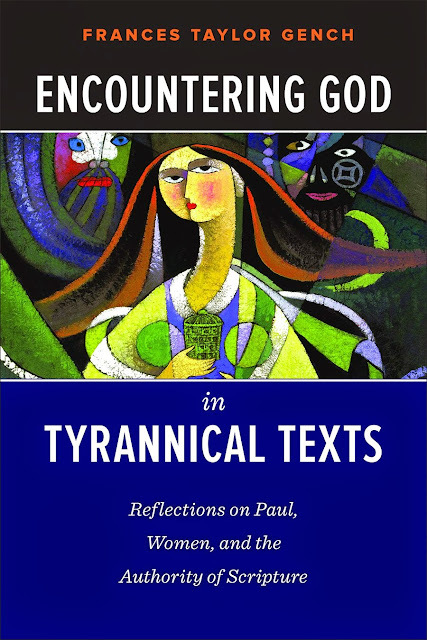 Encountering God in Tyrannical Texts is written by Frances Taylor Gench and published by Westminster John Knox Press (08 June 2015 - USA; 15 May 2015 - UK). Many thanks to Westminster John Knox Press for review copy. All images are © to their respective owners.